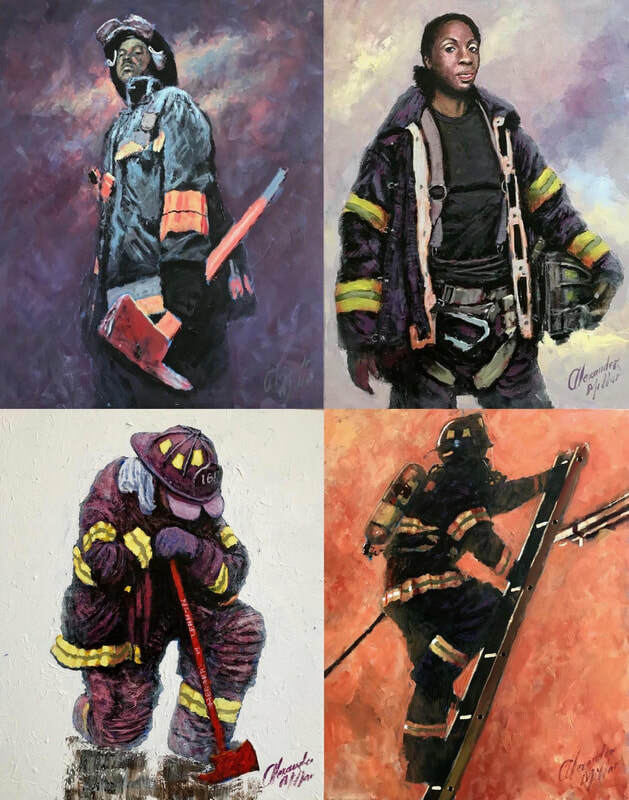 Alexander Millar’s highly collectible artworks sell for thousands around the world, this his first exhibition in the United States, showcases some of his best-known works as well as his most recent artwork of New York City’s firefighters. His hugely popular, ‘gadgie’ character makes an appearance, gadgie being a Scottish term for a blue-collar worker! These are some of Millar's best-known works, memories of his childhood, growing up in industrial Scotland recreated on canvas. As an entirely self-taught artist, Millar's style has been honed over the years, but his 'gadgie' character remains his iconic trademark. Shoes and shoulders are emphasized in these pieces of working men; that are inspired by the rail and shipping industries that were prevalent in Millar's youth and indeed in the shipyards of Scotland and Northern England. Tracey Lewis. She's the second-ever black female firefighter to be promoted to lieutenant in the department's history. Lewis has been a firefighter for 17 years, starting off as a cadet. She was an emergency medical technician and later worked on Engine 222 in Bedford-Stuyvesant Brooklyn. Currently, Lewis is only women of color who is an officer in the entire FDNY today. Keithroy Marcellus Maynard, one of the few African-American members of the FDNY, he joined the Vulcan Society, a group of firefighters who travel to predominantly black neighborhoods in an effort to recruit more African-American members. He became the youngest member of its executive board, helped hopefuls train for the written and physical exams, and inspired many to join the force. On September 11, 2001 he lost his life in the line of duty at the World Trade Center.